Okay here’s my second speed painting. This took me 45 minutes. I’m actually okay with this one, compared to yesterday’s post. 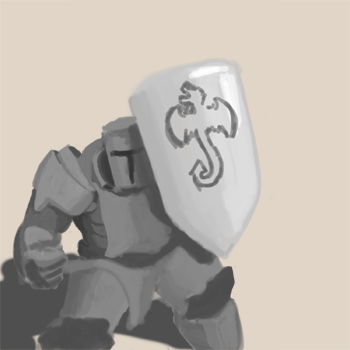 You can see that I have a much more defined picture of a knight holding his shield up, and that I was even able to get a little more defined on the shoulder armor. From yesterday I applied using keyboard shortcuts to change the brush size quickly, as well as blocking in big shapes and making decisions. I initially wanted to have the knight kneeling from the brunt of the force of a blow he was blocking, but after I had painted in the placement of the shield and the helmet, I felt it was better to have him standing with the view from above him. It gave me a new idea, and now I have this painting and the one I had started out wanting to do. I actually want to finish this piece, because the idea of it is good to me. Keep track of the ideas you have as you go through the process of creating something, whether that’s art, music, schedules, or even marketing campaigns. You’ll find that what you end up with is rarely what you started wanting to do, even if you’re good at what you do. The ideas that you start with and the ideas you come up with along the way are usually worth pursuing again once you finish what you’re working on. The bonus of keeping track of those ideas is that now you can approach them with more experience than last time. One other note: don’t show off your “learning” work publicly in the beginning. I’m breaking that rule to give you encouragement, that you are not alone and that you know the path you’re treading is not uncharted. Show a few people who will encourage you to continue learning, because that’s the feedback you need in the beginning.